We went out to the Dorset Wildlife Trust Sopley Common reserve again this weekend, as the weather was wonderful. We spotted lots and lots of these leafhoppers all hanging out on their preferred rhododendron vegetation. 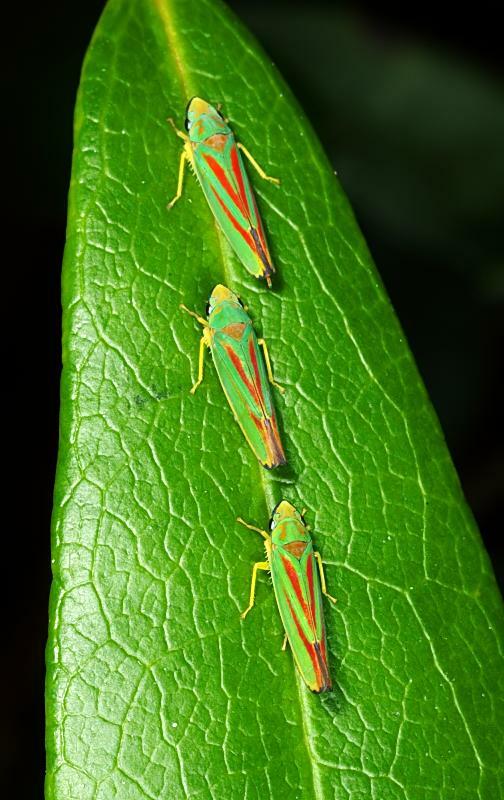 They are called Candy-striped leafhoppers (Graphocephala fennahi), though I believe Americans call them scarlet and green leafhoppers. It was fun to see these three all lined up have a drink from the plant. They are much bigger than the other leafhopper I photographed, probably about 1 to 1.5cm in length. They are native to North America, although they are now very common around Europe. Apparantly, when aided by a good wind, they can fly 150 miles, which I find incredible.